Kirstin learned early in her legal career that she loved closing business transactions. The clients’ satisfaction was rewarding, and she could see exactly how she had helped further their business goals. She quickly came to focus on mergers and acquisitions, and over time she focused on the industries where her clients operate: manufacturing and healthcare. More than 20 years later, Kirstin’s focus is still clients and their business objectives. 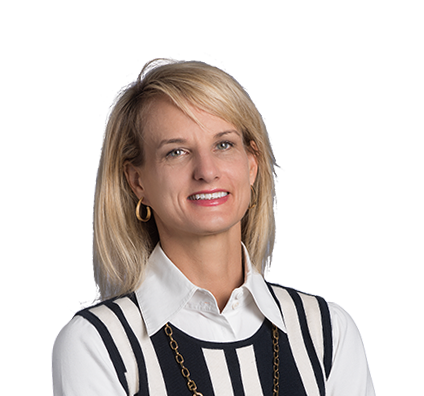 In addition to transactional and strategic guidance on mergers and acquisitions, she advises on securities law compliance, joint ventures, governance issues, private equity and venture capital investments, and other complex contractual arrangements. Kirstin is known for her creative problem-solving and practical dedication to getting deals done. Her priorities are to find ways to say “yes” to client objectives and to make her clients’ lives easier. As a corporate attorney, Kirstin is used to working with in-house counsel, and she strives to help her in-house clients shine. Just as AMC Theatres was preparing for a $1.1 billion stock and cash acquisition of Carmike Cinemas, executives at both companies walked away from the deal on the eve of signing. When a new AMC CEO arrived nine months later, the company chose to pursue the acquisition again—only with renegotiated terms and a new price to satisfy key shareholders. Kirstin managed a complex renegotiation at the eleventh hour, and the acquisition went ahead. After putting down $1 million in earnest money, a group of investors preparing to make a major acquisition from a public company found that they didn’t have the appropriate financing to complete the deal. Kirstin’s client hoped to step into their place. It was an opportunity to acquire two platform companies, but the client would have to execute the deal, including full diligence on financing, within a two-week period. Kirstin quickly put together a skilled team of Husch Blackwell professionals to manage the deal and served as lead transaction counsel, ensuring that the client was able to make an acquisition that proved key in building their organization. Represented AMC Theatres in $172 million cash acquisition of Starplex Cinemas. Represented AMC Theatres in $1.1 billion stock and cash acquisition of Carmike Cinemas. Represented AMC Theatres in $1.2 billion acquisition of Odeon & UCI Cinemas. Represented AMC in $45 million divesture of interest in Screenvision. Represented AMC in significant investment in virtual reality technology. Represented private equity firm in acquisition of manufacturer of dock, warehouse and industrial safety equipment manufacturer and several follow-on acquisitions, including one cross-border acquisition. Represented private equity firm in acquisition of water filtration company. Represented private equity firm in acquisition of distributor of assembly line equipment. Represented private equity firm in acquisitions of telecommunications and IT solutions provider and several follow-on acquisitions. Represented private equity firm in acquisition of a window component manufacturer. Represented private equity-backed provider of home healthcare services in strategic acquisition of home health providers in Texas and Tennessee. Represented private equity-backed provider of home healthcare services in acquisition of home healthcare provider in Texas and Oklahoma. Serves as "outside general counsel" for several manufacturing and healthcare companies. Represented the shareholders of healthcare software company in sale to private equity firm. Assisted provider of mobile healthcare services in executing growth strategy through acquisition of strategic targets. Represented UK-based engineering company with sale of U.S. division for more than $100 million. Represented large not-for-profit health system in joint venture with private equity backed company providing emergency healthcare services in Colorado. Represented mezzanine lenders with investments in industrial chain manufacturer, food ingredient manufacturer and student-authored book publisher. Counseled hospital systems on numerous financing transactions. Represented seller in $100 million sale of online business to public company. Advised one of North America's largest less-than-truckload shippers in sale of division. Represented cement company in formation of $60 million importing joint venture. Counseled hospital system on financing for construction of several ambulatory surgery centers. Counseled plastic injection molding company on various contracting and employment matters, buyout of investor and refinancing of working capital loans. Advised angel investors on investment in biotech company developing cancer immunotherapy treatments. Represented low-voltage wire and cable company in various corporate transactions, including supplier issues and buyout of investor. Advised early-stage companies in obtaining angel and venture capital investments. Advised not-for-profit hospitals on variety of transactions, including long-term operating leases, joint ventures and transfers of control. Represented mezzanine lender in investment in industrial chain manufacturer. Counseled large hospital system on $200 million financing transaction. Advised cement manufacturer on buyout of joint-venture partner and lease of shipping dock. Kirstin loves to travel, especially to places where she can enjoy the outdoors. She and her family enjoy the beach and national parks, with Yellowstone being her favorite destination to date.